Artificial Grass… Spring is Near! With Spring around the corner, it is time to start preparing your lawn for the new season. That’s right, break out the lawn mower, fertilize the lawn, turn on your sprinkler system (if you’re in Colorado), and get ready for a higher water bill, or… you can have us install All-Year-Round ProGreen Artificial Grass so that all you have to worry about is your plants and flowers. Are there different types of Artificial Grass to choose from? As a proud dealer of ProGreen Synthetic turf, there is a variety of artificial turf products to choose from. Their high standards begin with the raw materials needed to produce their turf, and use cutting-edge polymers from top tier suppliers to make their fibers. There is no other company that has the control over the way their products are made. Click Here to see your choices. ProGreen is a USA based company that manufactures all of it’s synthetic turf from start to finish in their USA based facilities. Very little maintenance is required. From time to time there will be dirt and rocks that end up on your all-season lawn, all that needs to be done is to hose it down and where necessary brush or sweep it away. Artificial Grass Drains very similarly to natural grass. 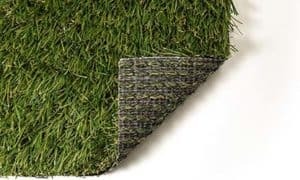 Most Artificial turf uses perforated turf so the water can drain but it’s also where weeds can grow through the little holes, especially if your installer skips the weed barrier during the installation. When you choose us, we use the advanced ProGreen’s ProFlow Technology that not only eliminates these holes, but actually increases drainage efficiency. And, this aggressive drainage remains consistent throughout the life of the turf. 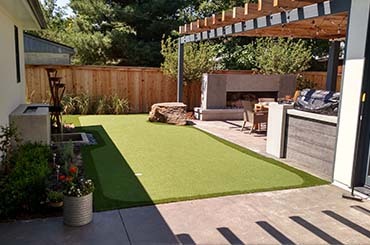 As a top-seller of Progreen Synthetic Turf and a certified artificial grass installer for Home Depot, you can count on us to install your new lawn, play area for your kids, putting green, dog area into something you will be proud of.